The Cabin is stylish and practical. 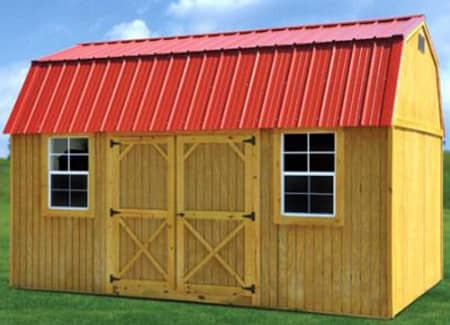 It is available in 10' and 12' widths (14' and 16' widths available in some areas) with a gable style roof. Features for all models include a 36″ 9-lite door, 3-2'x3' windows, and a 4' front porch. It is an ideal solution for a small office, or playhouse. For more upper storage space and cabin style consider the Lofted Barn Cabin. Finally! A rustic, stained look that maintains its appearance for 10+ years! Floor joists are 2×6’s in 10′ and 12′ withes, 16 inch on center and set into notched skids to prevent twisting. Siding and trim is LP Smartside.